It was a walk over for Governor Ben Ayade of Cross River State yesterday as he easily emerged as the candidate of the Peoples Democratic Party (PDP) for next year’s governorship election. Ayade, who was the sole aspirant, garnered 1,927 votes in the primary election that involved delegates from the 18 local councils of the state at the U.J. Esuene Stadium, Calabar venue of the event. Also, Governor Ifeanyi Okowa of Delta State has emerged the governorship candidate of the PDP for 2019 general elections in the state. Okowa, a sole candidate, emerged with 3,252 votes in the election conducted by Chief (Mrs.) Uzor Nwandu-led five-man panel. Rivers State Governor Nyesom Wike has been returned unopposed as the PDP’s candidate for the 2019 governorship election in the state. 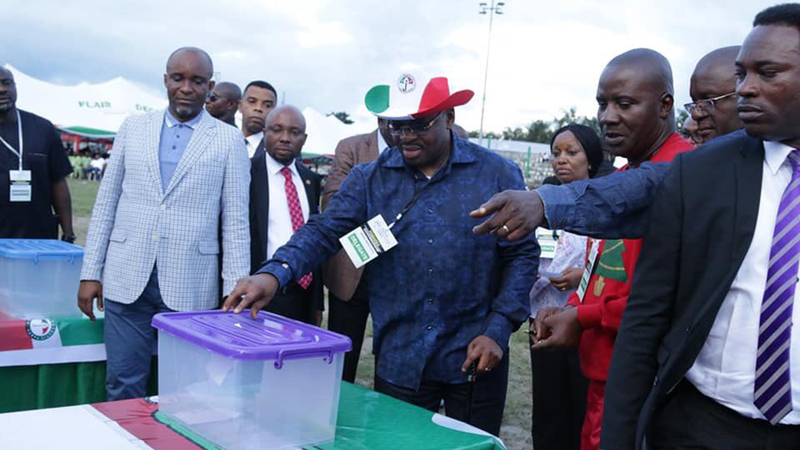 Wike polled 3,345 votes from the 23 local councils of the state at the party congress held at the Sharks Stadium in Port Harcourt yesterday. 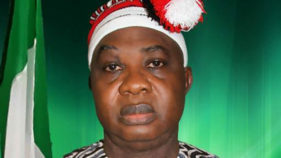 In the same vein, there was wild jubilation at the Nnamdi Azikiwe Stadium, Enugu yesterday, as incumbent governor of the state, Ifeanyi Ugwuanyi, emerged as the governorship flagbearer of the Peoples Democratic Party (PDP) for Enugu State in 2019. Ugwuanyi, who emerged as the sole aspirant for the office of the governor in the absence of any other contestants, polled a total of 2,818 votes. Meanwhile, Governor Udom Emmanuel of Akwa Ibom State and the sole aspirant of the PDP for the position of governor for 2019 general elections has been returned unopposed. Emmanuel scored 3,807 votes to be returned. 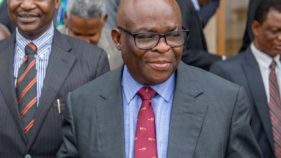 Also, Governor David Umahi of Ebonyi State yesterday emerged as the governorship candidate of the Peoples Democratic Party (PDP) for 2019 general election. Umahi emerged as the sole aspirant in the absence of any other contestants, which made him go into the contest unchallenged. In Sokoto State, former Commissioner for Local Government, Alhaji Manir Mohammed Dan’Iya, yesterday emerged the PDP gubernatorial candidate having polled 2,175 affirmation votes out of the total 2,187 cast by the delegates. 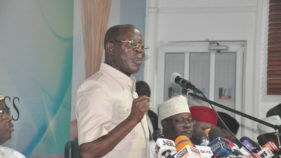 He became the sole candidate for the party’s gubernatorial ticket following the last minute withdrawal of Prof. Hamza Maishanu from the race.